With so many different types of paint brushes available, how do you choose the right one for your project? We'll show you. Faced with a bewildering array of paint brushes at your local home center, paint store or hardware store, choosing the right paint brush can be overwhelming. But don’t worry! Here’s how to narrow down the different types of paint brushes and pick the right brush for your project. Match the bristle type to your finish. Paint brushes are available with either synthetic bristles or natural bristles made from animal hair. If you’re using paint or varnish that can be cleaned up with water, then choose a brush with synthetic bristles. If you’re applying oil-based varnish or paint, a natural-bristle (Black China, Ox-hair Blend or White China) brush may be a better choice. You can use synthetic-bristle brushes for oil-based paint, but in most cases, natural bristles will provide a smoother finish. Avoid using a natural bristle brush to apply water-based finishes, though. The bristles will soak up moisture and become too soft. Synthetic brushes are available with nylon, nylon/polyester blends, or Chinex bristles. We recommend choosing either a nylon/polyester blend or, if you’re willing to pony up a little more cash, a Chinex- bristle brush. A nylon/polyester blend provides a good compromise between softness, for a smooth finish, and stiffness, for better control. Chinex bristles are designed for optimal performance and easy cleanup. If you’re buying a natural-bristle brush, you’ll also have a choice of bristle types. We won’t get into the different natural bristles available. But in general, spending more will provide you with a better quality brush. Choose the right size for your project. 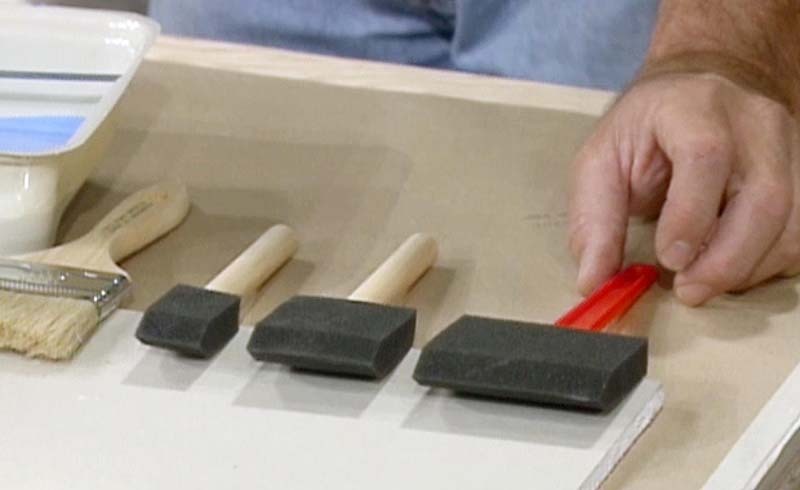 If you’re painting or varnishing woodwork, choose a small brush for more precise control. 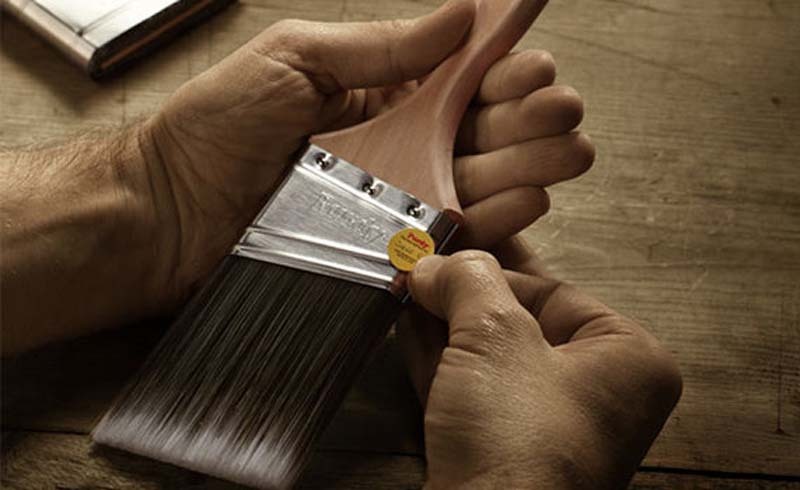 A 1-1/2-inch-wide brush is ideal for most woodwork jobs. But, if you’re painting trim that’s wider than 3-inches, a little wider brush, up to 2-1/2-inches, would be a better choice. If you’re painting walls you’ll use a paintbrush primarily for cutting in. Pros sometimes use 3- or 4-inch-wide brushes for this, but we think a 2-1/2-inch-wide brush is ideal for most DIYers. The only time you should consider a brush wider than 3 inches is if you’re painting wide siding, fencing, paneling or other wide, flat surfaces. Now that you’ve narrowed your choices by choosing either a synthetic- or natural-bristle brush, and you’ve chosen the best width for your project, you only have a few more decisions to make. You’ll notice that some brushes have bristles that are cut at an angle and some have square ends. If you’re planning to use the brush either to paint trim or cut in before rolling walls, then we recommend choosing a brush with an angled tip. The angled tip makes it easier to control the line of paint for a more accurate job. Choose a square-tipped brush if you’re painting wide, flat surfaces. Spend a little more for a high-quality brush. We know it’s tempting to buy an inexpensive brush and then throw it out rather than bothering to clean it. This does make sense if you’re doing something like spot priming with alcohol or oil-based stain sealer where the quality of the finish isn’t important and cleaning would require the use of a solvent. Disposable, aka chip, brushes work great for this. But, for most projects you’ll be glad you spent extra on a high-quality paint brush. Better brushes hold more paint, provide smoother results, last longer, and can be easier to clean. Cost is the simplest indicator of quality. Expect to spend between $10 and $20 for a top-quality brush. Start your collection with this brush. Eventually, you’ll want a collection of brushes so you’ll have just the right brush for any circumstance. But if you’re just starting out, and want an all around brush that will work for painting trim or cutting in a room, we recommend a 2-1/2-inch-wide, angled brush with Chinex bristles. This size brush holds a good amount of paint, and yet is small enough for precise control. If you’re a complete novice and need to develop brushing skills, then start with a 2-inch-wide brush instead.